by TYLER VAUGHT and MEGHANN ELRHOUL. Published by TWITTER on 21 June 2018. The concept of brands partnering with creators to produce ads is not something new. Take a scroll through the numerous social feeds on your phone and you are bound to see branded content from a creator. For marketers today, it’s not “if” you should be partnering with creators but more so “why and how” to partner with them. What’s even more important for brands to understand is that there is a unique why and how for every platform – especially for Twitter. To help brands and agencies better understand how to incorporate creator content into their Twitter strategy, we partnered with Magna and IPG Media Lab on a Twitter-sponsored study to analyze what brands and marketers should know about working with creators, how to optimize creator content, and what they have to gain from working with creators. More than any other platform, Twitter is about conversation. Creators turn to Twitter to build a community, and their followers come to the platform to connect directly with the creators they love the most. In fact, 61% of Twitter users follow a creator, more so than on any other platform*. When individuals who carry a wealth of influence and creativity become more accessible and their thoughts and conversations more transparent, audiences begin to trust those individuals. People look to creators for recommendations over online reviews, brand Tweets, and traditional TV and digital ads when it comes to what to buy, where to go, and what to watch. Today’s word-of-mouth marketing is often driven by creators on Twitter. “The results of this media trial proved that creator content is a valuable asset for brands. To keep up with the fast-moving pace of social environments, branded creator content is a quick, easy, and affordable way for advertisers to impact consumers,” Kara Manatt, SVP Intelligence Solutions & Strategy at MAGNA. Creators are unique in that they care just as much about the content they produce as the brand does – first and foremost, original content is their livelihood. 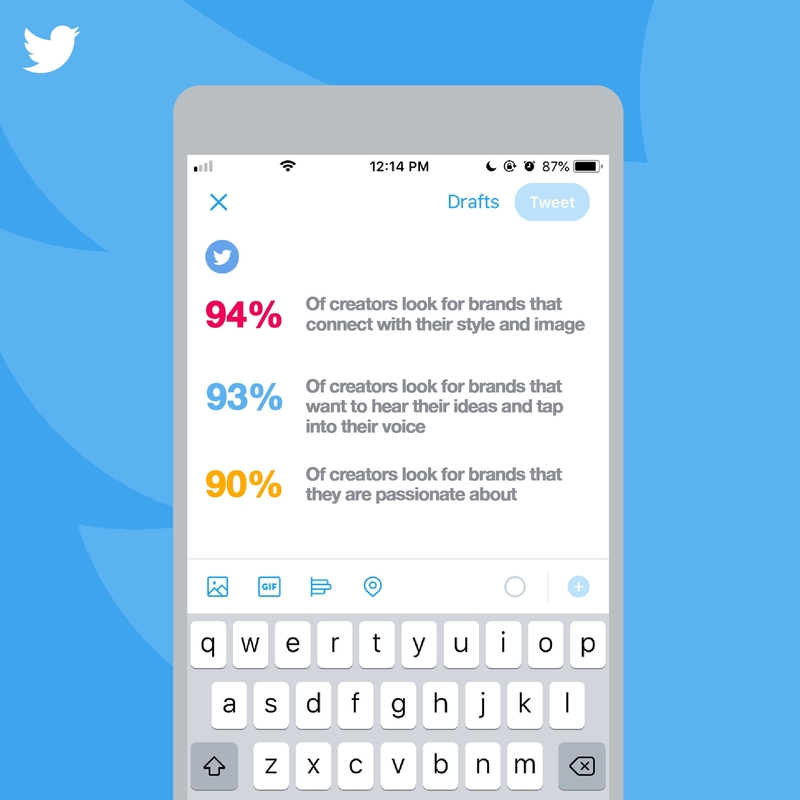 In order to ensure their content feels authentic, 94% of creators look for brands that connect with their style and image*. They want to work with brands that share a common aesthetic, and partner to create content that feels true to their message and their audience. Creators also want to be more than just a production resource – collaboration is key to successful creator-driven marketing campaigns. 93% of creators look for brands that want to hear their ideas and tap into their voice*. Creators are experts at eliciting a response from their audience and brands should trust this expertise. Provide guidelines but let the creator come back with ideas that feel genuine to their feed. +64% increase in recommendation intent*. 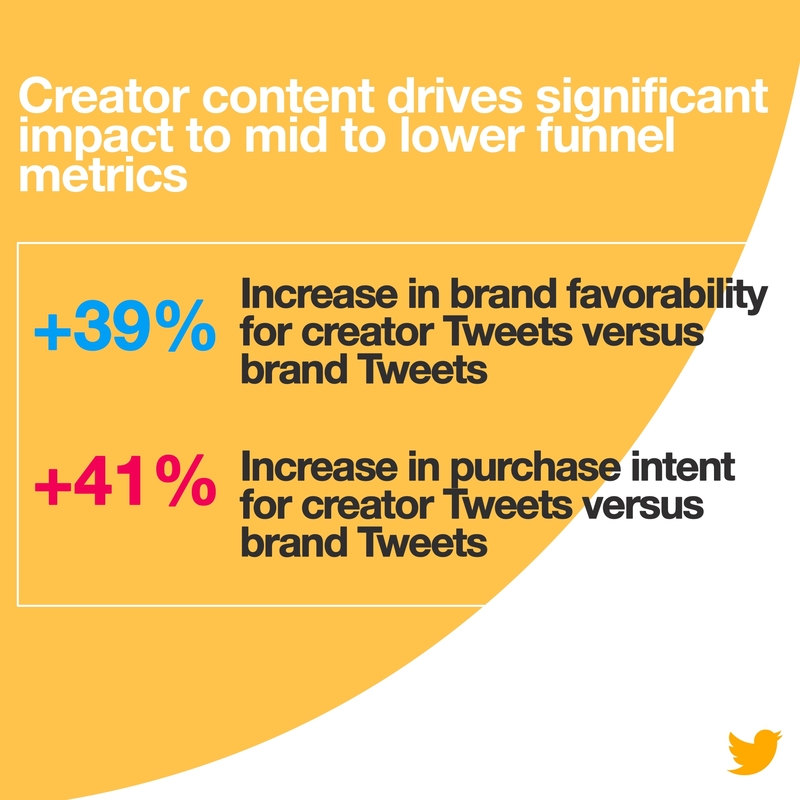 In fact, branded content from creators drives increased view times for those ads on Twitter. Audiences on Twitter spend 24% more time watching an ad from a creator, because they are more genuine and trustworthy*. This in turn drives significant impact to lower funnel metrics. 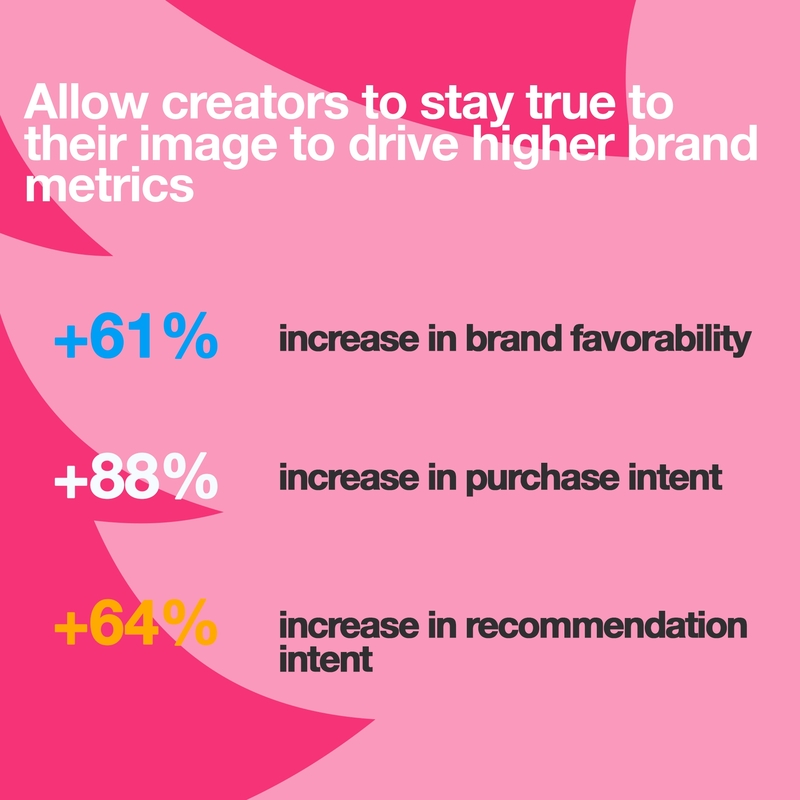 Twitter users who recall an ad from a creator show a +39% increase in brand favorability, and +41% increase in purchase intent, versus ads recalled that were produced by brands*. Finally, once you understand “why” and “how” to work with creators – you also need to determine the best way to connect with them. From a creator’s standpoint, they’d much rather work with experts in the space who can effectively translate the brand’s needs while supporting creators’ creative integrity. For brands on Twitter, Niche is your solution. Niche is Twitter’s talented team of Strategists and Content Managers who connect brands on Twitter with the world’s best creators to reach an audience through premium, original content. Niche has one of the largest and most diverse community of creators in the world and understands fully how to optimize branded creator content across any category. In addition to custom content needs, Twitter also just launched Creator Originals, a new program that enables creators to produce their own high-end content series. Brands can partner now with creators on programs, in line with our in-stream video sponsorship offerings. Creators are what’s happening on Twitter – and with Niche, it’s easier than ever to partner with them for powerful branded content. We conducted a research study with Magna and IPG Media Lab in a two-phased approach, using a creator perspective and consumer perspective. In Phase 1, the creator perspective, we partnered with Niche to survey creators in the US and UK and understand the creator experience of making content and the process in working with brands (n=171). In Phase 2, the consumer perspective, we surveyed participants in the US from a representative online panel via a mobile survey (n=3,251). We first asked demographic and media consumption behavior questions and then participants were asked to view their Twitter feed to determine their ad experience. We tested promoted content and leveraged a post experience survey to measure traditional brand metrics. This was done across 12 brands and 9 industry verticals.